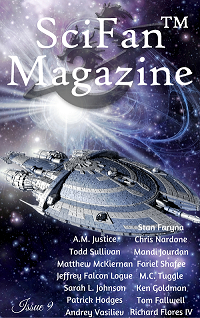 SciFan Magazine has published my latest story, “Fate’s Daughters.” It’s available in paperback on Amazon. The protagonist, Dr. Thomas Lear, delves into Scottish mysticism to master the secrets of da-sheallahd, or second sight, and uses that knowledge to prove the existence of spin-off “daughter” universes, the most profound and disturbing theory in quantum mechanics. Lear discovers how to find and observe alternate versions of his life, and learns what would have happened if he hadn’t made choices he has long regretted. He also learns all choices, good or bad, have repercussions — and that even what we think are good choices can have shocking consequences. An instructor leading an improv workshop I attended at Queen City Comedy in Charlotte inspired this story. E.B. urged everyone to “let go” and react honestly to the scenes they were acting out. At one point she said, “We’ve forgotten how to focus! The only thing that matters is happening in the place and moment you’re living in right now.” Her words hit me, and I kept thinking about them after the workshop was done. That advice is just the medicine we need in our distracted age. BTW, if you want to know more about daughter universes and quantum mechanics, Space.com has this short, helpful article, one of the pieces I read researching the science behind the story. I am indebted to several beta readers for their invaluable insights as this piece evolved, including the Dark & Stormy Plotters League, which is the sci-fi/fantasy critique group of the Charlotte Writers’ Club. But I want to give special thanks to Cathleen Townsend for her inspired suggestions, all of which I incorporated into the manuscript. I salute l’artista migliore! Thank you! I had a great time with this piece. I pre-ordered it, Mike. I want to see what changes made their way into your story after we Dark & Stormies read it that first time. And congratulations on getting it published — that’s always a nice feeling, isn’t it? Thank you! Yes, it’s a mystery how these things evolve. I think you’ll recognize some of your suggestions in the final draft. Your writing are intense and full of meaning. Everyone can become a writer with personal effort but to become a great writer is a hard path. Some people say that is the Fate that lead us through this path. Some like “Ulysses” and his personal Odyssey refused to believe that there is some sort of invisible lines moving us like puppets according their planning and desires. What we really are? Nietzsche once said that the our real truth is that we are “eternally condemned to untruth”. After spending decades of my life writing and researching I’m forced to admit that we lived under a fake history tailor-made for the hands of the Renaissance writers. There is no one single organic document (papyrus, paper, piece of leather or hieroglyphs endorsing everything what we know and learned since we were born. The truth is right in front of any of us all the time but we don’t have knowledge to uncover it. Maybe we will never have it. Those who tried it were murdered, tortured. We all are the guardians of this fake status quo. I are ready to die defending what we don’t know and what we don’t understanding. This is the reason that I love write about Fiction and Sci-Fi. I don’t write for people. I write for me. I know what I’m and I know what they are. I’ll not blame anyone of them. Life goes on as always. I just ordered a copy at amazon. Your blog is impressive. Thank you. I enjoy keeping the blog. I hope you enjoy SciFan Mag.